Hello Reader, have you been searching for How to make and receive calls on mac computer? Then this is for you. Apple has been rendering quality services by increasing the features of their products starting from the iPhones, iwrist watches, and Mac computers and so on. Today you are going to be shown how to go about setting your iPhone and Mac to make and receive calls on Mac. Please note that this setting will not pose any threat to your Mac computer and in fact, it is one of the added features to most of the Apple products. The number one step to take to achieve this aim is to sign in to both iCloud and FaceTime with the same Apple ID on both your Mac and iPhone. You are required to connect both the Mac and iCloud to the same network but not with a Bluetooth connection. 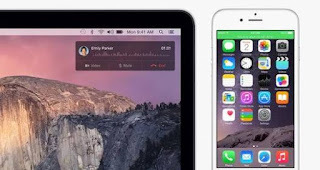 After completing the above important tasks, the next thing to do is to make your Mac and iPhone share phone calls. This can be achieved by picking up your iPhone, go to Settings > Phone > Calls on Other Devices, then turn on Allow Calls on Other Devices. Using your Mac, open the FaceTime app and go to FaceTime > Preferences and check the box for Calls From iPhone. If you have successfully carried out the above laid out steps then you have done the basic things required of you. First of all when you receive calls on mac, you will be notified in the top right corner of your desktop, click the Accept button to answer the call. What of placing a call from your Mac, you have to make use of the Contacts or FaceTime apps. If you are making use of the Contacts App: open the Contacts app, select a contact and click the call button. If you are making use of the FaceTime App, you can make a phone call from your Mac by clicking the telephone icon rather than the video-camera icon to make a FaceTime call. The search box in the FaceTime app is where you type in a Phone number and then click the telephone icon to place a call. Note that the search box seen in Facetime app is not in the Contacts app on Mac.